New Delhi, February 5: In a tragic incident, a trainee aircraft of Carver aviation, a pilot training institute in Maharashtra, crashed on Tuesday afternoon. 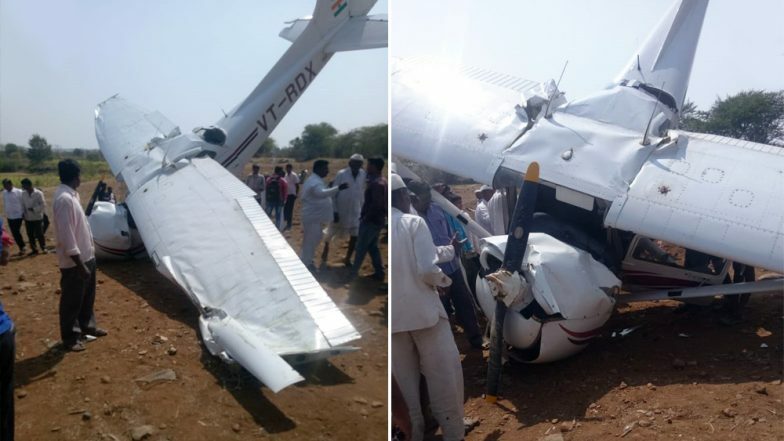 According to a tweet by ANI, the aircraft crashed near Indapur in Pune. The trainee pilot has been injured in the crash. Reports inform that he has been rushed to a hospital in Baramati. More details awaited. Earlier this month, two pilots were killed after a mirage 2000 trainer fighter aircraft of Hindustan Aeronautics Limited (HAL) crashed at HAL Airport in Bengaluru. At first, both pilots had ejected, but one of them succumbed to his injuries after he had landed on the wreckage of the aircraft. Reports state that the incident took place near Yamalur off old Airport Road in Bengaluru. The other pilot too died later. The reason of the crash is yet to be ascertained. Earlier in January, an Indian Air Force (IAF) Jaguar fighter plane crashed in Uttar Pradesh's Kushinagar. Reports inform that the aircraft had taken off from Gorakhpur Air Force Base. The pilot managed to eject safely from the aircraft. The IAF stated that an inquiry has been ordered to investigate the cause of the crash.